As most my readers know by now, two of my passions in life are history and boxing. That being said, I jump at most opportunities to visit locations associated with the history of boxing. 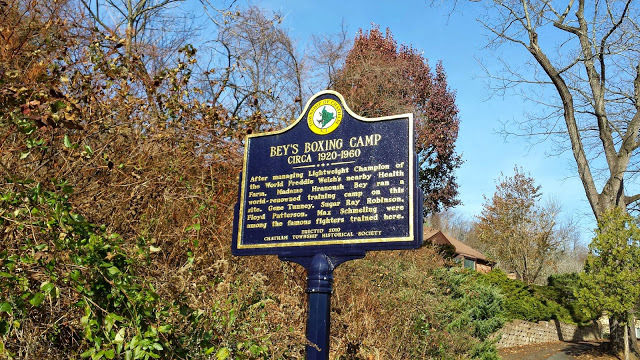 When I discovered that Chatham, NJ put up a roadside local history marker for Madame Bey's Boxing Camp, I put it on the top of my "must see" list. 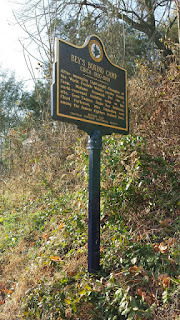 I drove out to Chatham last weekend on a chilly fall afternoon, and found the marker in a residential area on River Road. It was very interesting to see and photograph this marker, because I was also able to take in the terrain in which Madame Bey's boxing campers trained. River Road has a particularly curvy feel to it, along with nice inclines to support the conditioning of fighters. 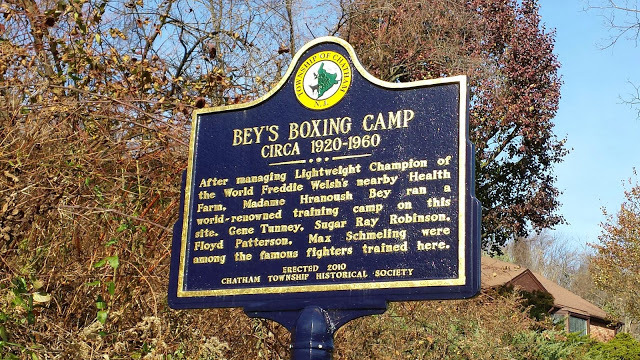 For those of you who also plan to make the trek out to Chatham to see the former location of Madame Bey's Boxing Camp, you will have no problem finding the marker with GPS via the address I provided above. "Can you picture world famous boxers running down River Road? 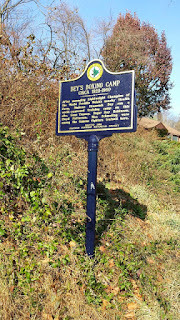 It happened in the mid 1900’s as Madame Bey’s world famous prizefighting camp operated on River Road from 1918 through 1960. 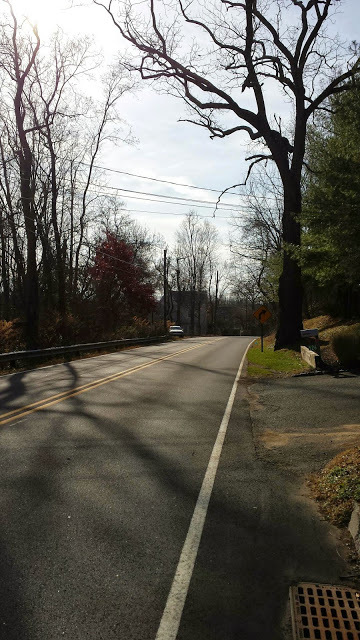 The Chatham Township Historical Society has commemorated the site at 516 River Road, placing its third historical marker there last week. Madame Bey must have cut quite an interesting figure back in the early 1900’s in the rural township. According to John Cunningham’s book Images of America: Chatham Township, Bey was born in Turkey, graduated from the American College in Constantinople, spoke four languages, was a trained soprano and was married to the secretary of the Turkish Empires Delegation in Washington, D.C. Close friends of President McKinley, she was only two people away from him when he was fatally wounded by an assassin. Madame Bey came into the world of boxing via the Welsh Wizard, also known as Freddy Welsh the lightweight boxing champion from 1914 to 1917. He invested his winnings in a mansion on Meyersville Road and opened a health farm for businessmen. 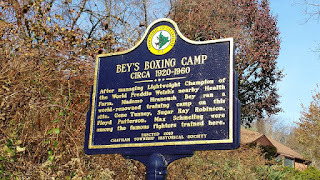 Upon joining the army in 1920, Welsh asked Bey to continue the health farm which she expanded to include prizefighters. In 1926 she moved the camp to her own farm, built a full-size outdoor boxing ring and staged daily boxing exhibitions. 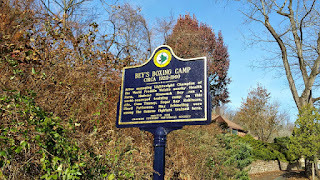 The boxing camp hosted many prominent contenders from all over the world who trained on River Road. She ran a tight ship with no drinking or swearing. 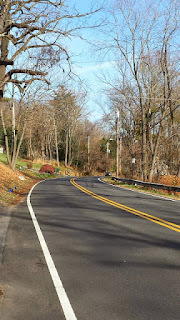 Gene Tunney, Mickey Walker, Max Schmelling (Adolf Hitler’s favorite,) Jimmy Braddock, (known as the Cinderella Man), Kid Chocolate, Kid Gavilan, Floyd Patterson, Sugar Ray Robinson, Rocky Graziano, Archie Moore and many others trained there and were frequently seen running on township roads. Exhibition matches were held on Sundays and in the audience were sports writers and local residents. 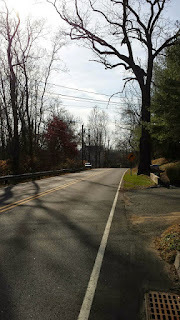 The Chatham Township dateline was seen in papers around the world on the sports writers’ articles commenting on the various fighters chances before matches, large and small. Madame Bey died in 1942 but the boxing camp continued to thrive for more than 20 years, run by her assistant Ehsan Karadag. 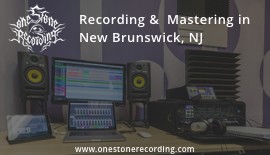 It closed in the 1960’s when the so-called Borscht Belt Hotels started to provide free training space for boxers with the purpose of attracting patrons."